Posted on 14, January 2016 by EuropaWire PR Editors | This entry was posted in Belgium, Education, Food & Beverage and tagged 'Bijloke' beer, 'Bijloke' beer in Cambodia, Daun Penh Food & Beverage Co., Ghent University. Bookmark the permalink. GHENT, 14-Jan-2016 — /EuropaWire/ — Ghent University has reached an agreement with the Cambodian company Daun Penh Food & Beverage Co. to launch the ‘Bijloke’ beer, which was developed at Ghent University Association. 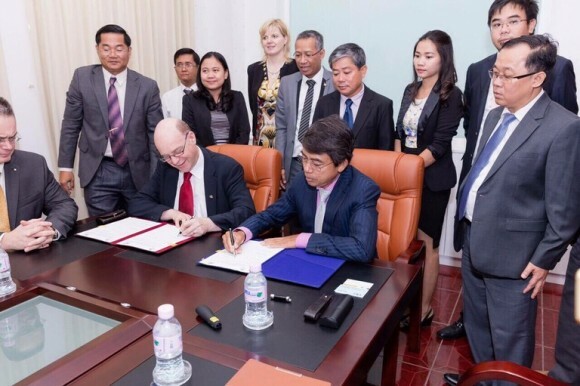 The negotiations are led by Professor Guido Van Huylenbroeck (Academic Director of Internationalization) and Professor Benedikt Sas (IOF Consortium Food2Know).In Cambodia, they signed a license agreement with the company Daun Penh Food & Beverage Co., which regulates the transfer of the recipe of the ‘Bijloke’ beer, which was developed by Professor Anita Van Landschoot and her team from the Department of Applied Biosciences. The blond fermented beer with a typical taste of ester and hop will carry the name ‘Sakrum’. The agreement shows that internationalization at Ghent University involves not only student exchanges and scientific research, but also valorization ofknowledge developed at the university. The agreement was made with the help of Ghent University TechTransfer and throughmediation by Mr. Chay Nowé, Consul General of Kingdom of Cambodia, and the Cambodian Ministry of Education.